We've apparently been using the word "promising" to mean "showing signs of future excellence" since about 1600. 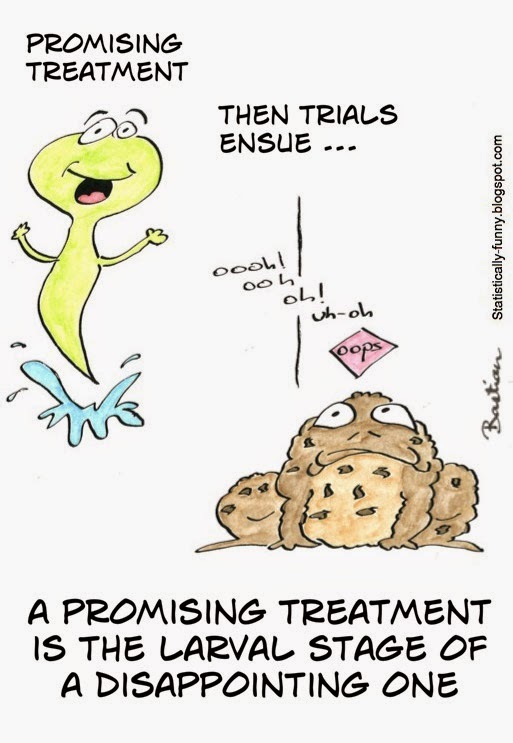 I first wrote about the tendency of "promising" treatments to metamorphose into "disappointing" treatments in a BMJ piece about evidence based mistakes. Early results, after all, can't promise anything at all. For all sorts of reasons, research findings are themselves over-positive - or as John Ioannidis put it, false. In another of his studies, he found that it happens to even the most highly cited clinical studies in the "best" journals: a third have been contradicted or turned out to have over-estimated benefits. My cartoon graph depicts a cumulative meta-analysis: each new study is being absorbed into a summation of the evidence so far. With 4 studies, it's shifted from the "this helps" side of the ledger over to the "this harms" side. See more about cumulative analyses in this classic article. 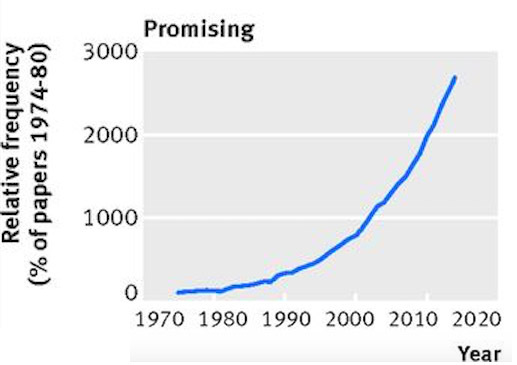 Speaking of classic articles, here's another: in the BMJ's 2015 tongue-in-cheek christmas issue, "promising" was one of the positive hype words Christiaan Vinkers and colleagues analyzed in PubMed's abstracts - from 1974 to 2014. "Novel" was another favorite - it was one of the words with an increase of up to 15,000%: "At this rate, we predict that the word 'novel' will appear in every record by the year 2123"! A bold, innovative take! 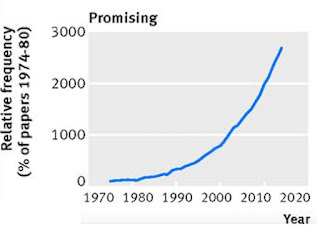 So is "promising" still increasing? Yep! It was 2.4% of 2014's PubMed records - and 2.8% in 2016. Several initiatives aim to keep the media to account on this, story by story: Behind the Headlines, Germany's Median-Doktor.de, Japan's Media Doctor, and the US Health News Review. Yet the breathless hype marches relentlessly on. On the plus side, at least words like "promising" mean that sometimes at least, marketing or optimism bias comes clearly labeled! This post was updated on 25 February 2017, adding the study and data on the use of "promising" in PubMed. This reminds me of the term "emerging evidence" which sometimes seems to mean "The current evidence is not strong but I promise it will become so".